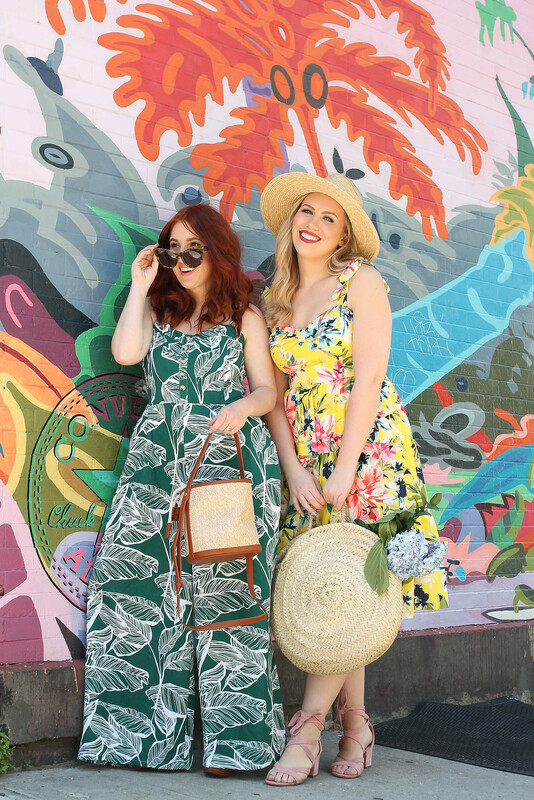 Two years ago the phrase “Palm Beach Chic” was reserved for stylish Florida grandmas, Lilly Pulitzer loving girls and home decor, but fast forward to Spring Summer 2018 and Palm Beach Chic is now one of the hottest runway trends! You know I love me some florals (Megan too! ), so this large, extra colorful trend was right up our alley! Picking out an outfit for this trend was actually hard because I wanted to wear ALL the things (don’t worry I’m sharing more of my favorites below!). 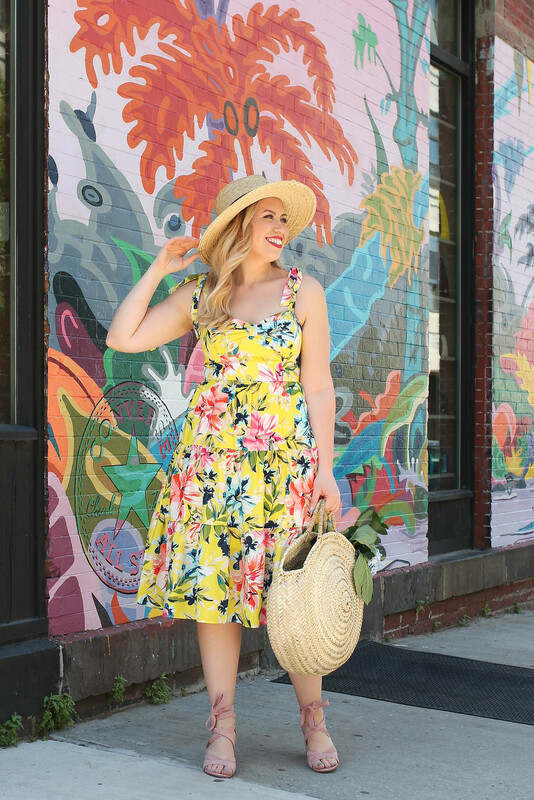 I finally decided on this bright yellow floral dress because I’ve seriously been crushing on all things yellow lately and I loved how vibrant this was compared to the other shades of yellow I’ve been wearing (check out those outfits here, here & here). And I LOVED the sweetheart neckline and the bow detail on the shoulders! Overall the perfect dress in the bright and bold world I live in! 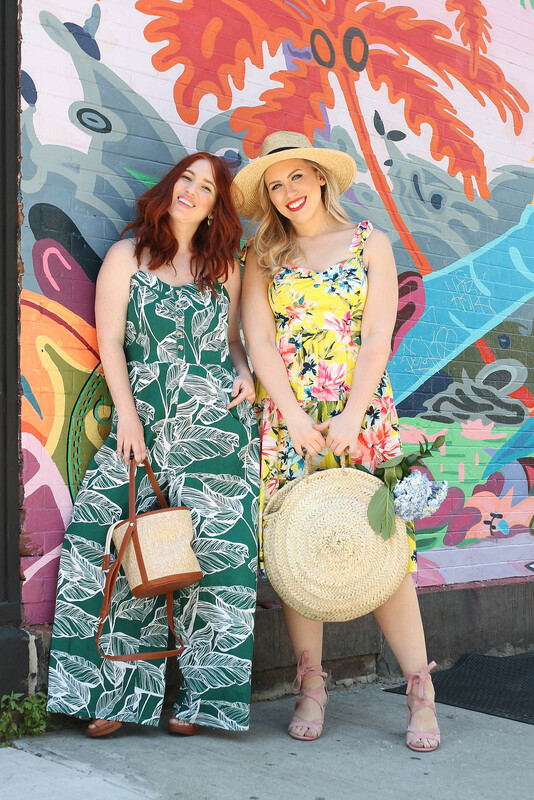 Megan went with an awesome over-sized palm leaf printed jumpsuit and I love how put together, yet comfy it looks! It would be PERFECT for a beach vacation! 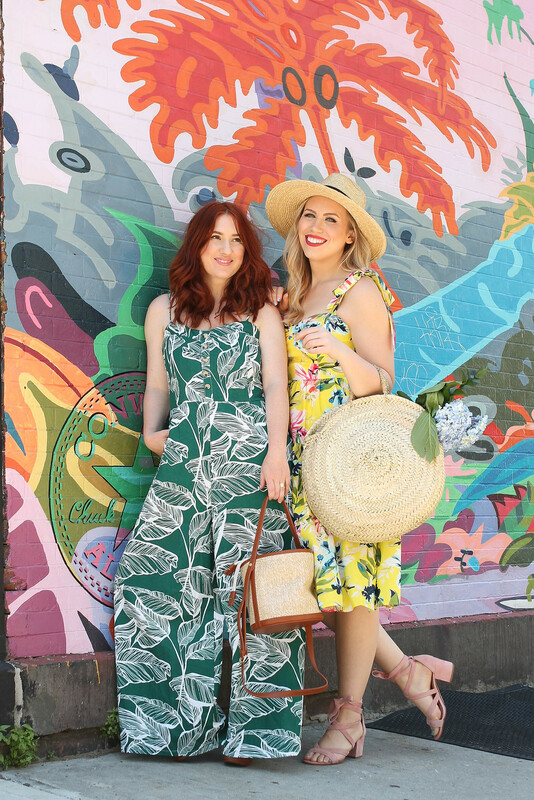 We both finished our looks with on trend straw accessories (palm beach chic approved) because we’re not only all about large, colorful floral prints this Summer, but we’re also absolutely loving straw accessories! 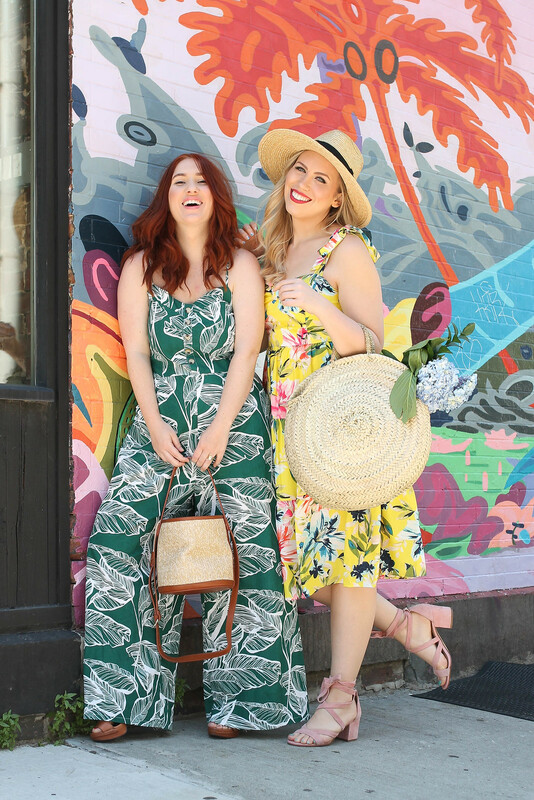 They are literally the perfect finishing touch to any Summer 2018 outfit and if you haven’t added a piece (like this bag that I’ve been using NONSTOP) to your wardrobe you need to! 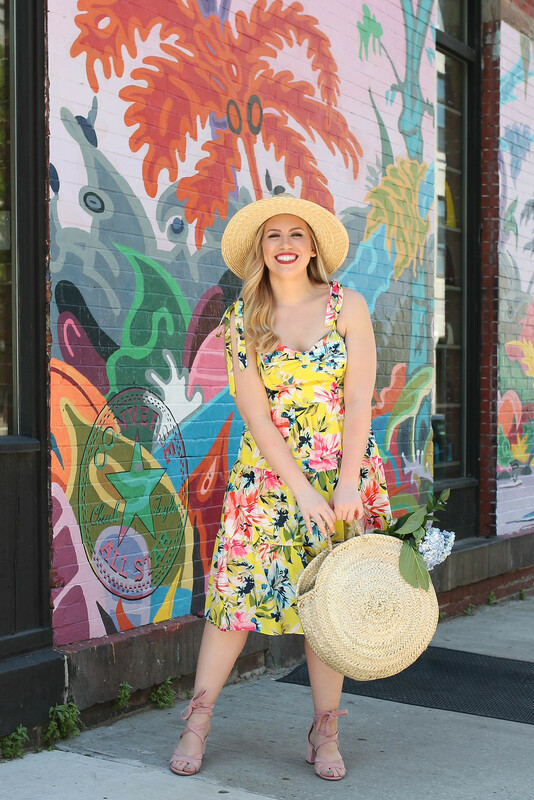 Like I mentioned above I rounded up more of my favorite Palm Beach-esque pieces for you to check out here! Happy Shopping! Looking for more inspiration…check out our Summer Wedding, Polka Dots & White Jeans Looks! And make sure to head over to Megan’s blog to see more photos of her outfit!